NASA’s Lunar Reconnaissance Orbiter (LRO) captured this view of China’s Chang’e 4 lander on Jan. 30, 2019. The area around the lander is enlarged by a factor of two relative to the native pixel scale; the bright speck between two arrows is the lander. The large crater in the center (just right and below arrows) is about 1,440 feet (440 meters) wide. China's history-making Chang'e 4 mission has been spied by one of its robotic moon-studying brethren. NASA's Lunar Reconnaissance Orbiter (LRO) recently caught a glinty glimpse of the Chang'e 4 lander, which on Jan. 2 became the first-ever spacecraft to make a soft touchdown on the moon's mysterious far side. 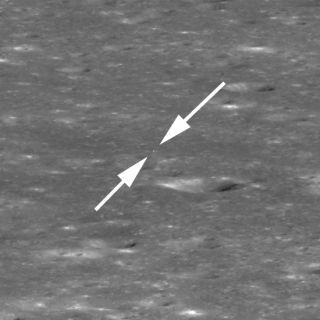 "Because LRO was 330 kilometers (205 miles) to the east of the landing site, the Chang'e 4 lander is only about two pixels across (bright spot between the two arrows), and the small rover is not detectable," LRO team members wrote in a description of the image, which was released today (Feb. 6). "The massive mountain range in the background is the west wall of Von Kármán Crater, rising more than 3,000 meters (9,850 feet) above the floor," they added. Arrows indicate the position of China’s Chang'e 4 lander on the floor of Von Kármán Crater in this image captured by NASA’s Lunar Reconnaissance Orbiter (LRO) on Jan. 30, 2019. The sharp crater behind and to the left of the landing site is 12,800 feet (3,900 meters) wide and 1,970 feet (600 m) deep. The mission could help scientists understand why the moon's near and far sides are so different from each other, Chinese officials have said. For example, dark volcanic plains known as maria cover most of the near side but are rare on the far side. The Chang'e 4 lander also totes a biological experiment, which contains fruit-fly eggs and seeds of a few plants, including cotton. The cotton seeds sprouted, becoming the first non-human organisms ever to live on the lunar surface (not counting the microbes that hitched a ride with NASA’s Apollo astronauts). The little plants froze to death soon thereafter, however. LRO has been circling the moon since 2009. The spacecraft's high-resolution imagery assists a wide variety of scientific studies and also aids planning for future robotic and human missions to Earth's nearest neighbor, NASA officials have said. Mike Wall's book about the search for alien life, "Out There," was published in November 2018 by Grand Central Publishing. Follow him on Twitter @michaeldwall. Follow us @Spacedotcom or Facebook.